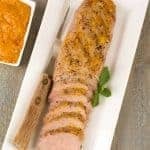 This juicy, flavorful, grilled pork tenderloin is served with a unique barbecue sauce made with fresh peaches and shot of bourbon. Preheat a gas or charcoal grill for indirect grilling over medium heat (350 to 400°F). Trim any excess fat and silver skin from the pork tenderloin, then rub with oil, season on all sides with salt and pepper and set aside. Heat a tablespoon of vegetable oil in a small saucepan over medium heat. Add the onion and cook until soft and translucent, 4 to 5 minutes. Add the peaches, bourbon, mustard, sugar and ketchup and continue cooking, stirring occasionally, until the peaches are soft and broken down, 12 to 15 minutes. Season to taste with salt and pepper. Remove the sauce mixture from the heat, allow to cool for 5 minutes, then purée until smooth using a hand held or conventional blender. Reserve about 2 tablespoons of the sauce for basting the tenderloin and transfer the remainder to a small serving bowl. Oil the grill grates and place the pork directly over the flame. Cover and grill for 3 minutes, then turn and brush about half of the reserved sauce on top. Cover again and continue grilling for 3 minutes more. Move the pork to the indirect heat side of the grill, and brush with the remaining sauce. Cover and continue cooking until a thermometer inserted into the center of the tenderloin registers 145°F (approximately 6 to 8 minutes). Transfer the pork to a cutting board and allow to rest at least 5 minutes before carving. Serve with reserved barbecue sauce on the side. Frozen peaches can be used for this sauce when fresh peaches are out of season, but we don’t recommend using canned.